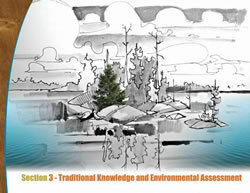 Environmental assessment (EA) in the broadest sense is not new to First Nations. However, over time, formalized processes for EA have been introduced and applied to First Nations and their territories. For example, both federal and provincial governments have formulated and regulated processes for EA. It has become necessary for First Nations to participate in these processes in order to have their views considered. the process for conducting TK studies.